Over the years, many of Eric's customers have asked him to carve totems. 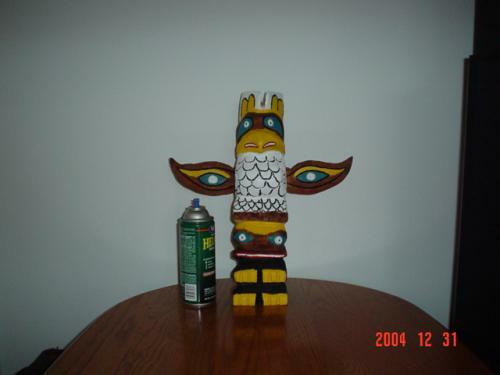 One day, Eric decided he would create a Tlingit-inspired totem pole. This little guy is approximately 10-12 inches tall and depicts the thunderbird and the bear. While not a traditionally created hand-carving as many totems are, this is truly a unique piece of art created with a chainsaw. Eric's wife loved the piece so much that she kept the sculpture on the bookcase for any of her guests to admire. She said, "A carver needs to have some of his own pieces to show off at home, too."